Few things are as painful as strep throat. Strep is a burning sensation that is there every time you swallow. It’s nasty, it’s irritating and just plain makes you miserable. Just like the flu and the common cold, this dreaded illness is most common when the outdoor temperatures get colder. Strep throat, often simply called strep, is common among children ages 5 to 15, and always increases in late fall, winter and early spring. It is caused by group A Streptococcus bacteria, which live in the nose and throat. People infected with strep spread the illness by coughing or sneezing, creating small respiratory droplets containing the bacteria. Other people can become infected if they breathe in the droplets, touch something with the droplets on it and then touch their mouth or nose, share the same cup or plate as an infected person or touch skin sores caused by strep (impetigo). Rarely, a person may become infected through food that is improperly handled. Strep can spread quickly wherever there is close contact or large groups of people, making schools and daycare centers a prime breeding ground for the illness. However, that doesn’t mean adults can’t get strep. It’s just more common among children. Additional symptoms may include headache, stomach pain, nausea or vomiting, especially in children. 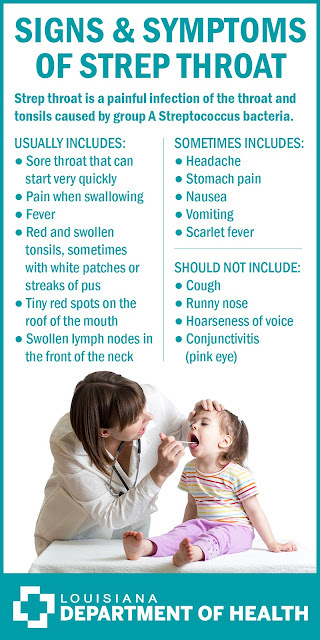 Some people who contract strep throat also develop a rash known as scarlet fever. Strep’s symptoms can mimic viral illnesses. If the illness also includes cough, runny nose, hoarseness of voice and/or conjunctivitis (pink eye), the culprit is not strep but a virus. Diagnosis comes from your doctor, who will perform a rapid strep test or throat culture. Upon confirming the diagnosis, your doctor will treat you with antibiotics – either penicillin, or amoxicillin if the patient has a penicillin allergy. The medication decreases symptoms and the length of illness, and prevents the spread of bacteria and serious complications. People infected with strep should stay home from work, daycare or school until they no longer have a fever AND have taken antibiotics for at least 24 hours. Symptoms should start to ease within a day or two after beginning antibiotic treatment. Practicing good hygiene habits is the best way to prevent the spread of strep throat. Always cover your mouth and nose when you cough or sneeze. If you use a tissue, put the used tissue in the trash. If you don’t have a tissue, cough or sneeze into your upper sleeve or elbow. After coughing or sneezing, always with your hands with soap and warm water for at least 20 seconds. Alternatively, if soap and water are unavailable, you may use an alcohol-based hand cleaner. Wash any glasses, utensils and plates after they have been used by someone who is sick. Once washed, these items are safe to use.